In the spirit of the holidays this week’s column will tackle such questions put forth as: Is it truly fair to pour the Good wine to those that know and the Bad to those that don’t? Which category does Nouveau Beaujolais appear in? And, finally, how can you get through the holidays without taking the edge off some of your less desirable relatives? I have read that it is proper etiquette to thankfully accept a gift of wine at your holiday event. On the other hand it is not bad etiquette not to drink it at said event. I have done this myself for these two different reasons: One the bottle is too good; the other, not good enough. 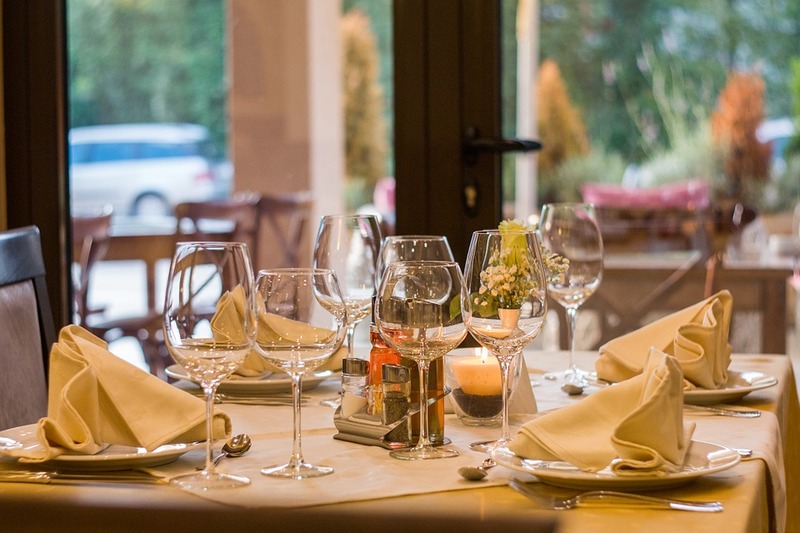 It may also depend on your menu, the guest size and/or the occasion. 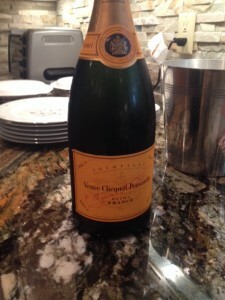 I have a magnum of non-vintage French Veuve Clicquot Ponsardin Champagne in my fridge waiting for the proper venue. 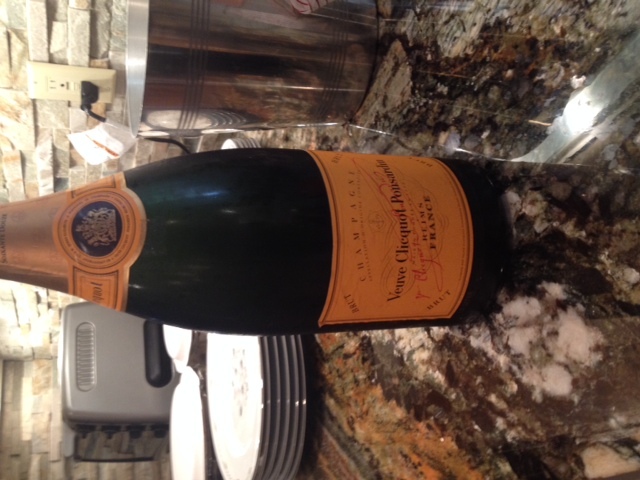 I thanked my guest for the gift and set it aside for when I had enough guests over to be able to finish it. Sometimes in the case of a gift that is apropos but not my choice, if I can swing it, I will decant it along with other bottles and let my guests decide what to try. Of course, if it is shamefully bad I will pour it into the gift giver’s glass first; let them choose if they would like to continue or to move on. I don’t correct, unless sincerely queried, but by having other bottles available it is entirely up to them. It’s a simple matter of taste; and we as wine drinkers all viva la difference. Nouveau Beaujolais is a little trickier. This wine is produced in France, going from vine to bottle in the speed of grape to raisin, and has been specially flown over on the Concord in time for Thanksgiving. Years ago Ed and I were eating at La Fondue Bourgogne and in the midst of our meal a great hubbub occurred: the Nouveau had arrived! The flurry to adorn our tables with small menu cards, as there was only one brand from one French vineyard; a stage had been set. All present took a deep intake of air, pushed ahead and ordered. This annual release is supposed to be an indicator of what the Beaujolais vintage will produce that year. Its celebratory incantation perfectly fitted for celebrations! It’s not such a big deal any more as our own local Napa wineries are doing their own versions. And if that’s not enough to spoil the thrill, it’s served chilled. It has lots of fruit. Like a dark White Zinfandel. Do we drink? Do we pass? As part of the festivities in a restaurant or holiday event at home we will always taste. And for your guests that like this offering both the domestic and the imported are very inexpensive. It’s a good compromise and a decent warm-up to your more resplendent selections. For your pumpkin pies, holiday sugar cookies and left over Halloween chocolate be careful pairing with a dessert wine. Dessert wines, with their high sugar levels, can stand alone. A melt in your mouth dessert zinfandel or cabernet, doesn’t require chocolate. And a late harvest chardonnay or Muscat can so thickly drench your tongue in honey your pie will pale in comparison. Again, it’s your personal choice. For me, after a big holiday meal a split of dessert wine can cover eight guests. After that an excellent coffee is all that I think is required. At the end of the evening consider that even your most undesirable “side effects” of the holidays can be dulled with the right wine selections. Including your mother’s friend that you didn’t invite but offers to wash all of the dishes if you keep her wine glass full. For that friend that breaks your wine glass every time try tying a large red ribbon on the stem. It cured my friend’s bad habit pretty darn quick! And your own hot flash will dissipate if you relax and unwind with that magnum of champagne, the one you’ve been hoarding for a special occasion, all by your lonesome, at the end of your event, hidden by the cigarette smoke of those that have exited to your yard and once all of the dishes are washed of course. Thanks for wanting to read about my tasting classes. There are many things that I can do – it’s really up to the host what they want as far as the lesson, wine, spirits and food. 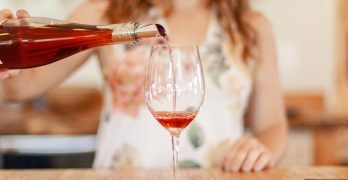 My Level Two certification from the Wine and Spirits Education Trust (WSET) has given me equal time with wine and spirits, though I tend to do more wine tasting classes. It’s all about entertaining the beginner-to-advanced taster that is interested in discovering the differences between the same wine varietal, learning about (or how to do) food pairing, single malt tours, vodka tasting, chocolate tasting and lesson, drinking etiquette lesson, etc., etc. I’ve done lessons on wine service for wine bars and have talked to up to three hours to groups of wine 101ers as I led them through a wine and food pairing. Feel free to forward this information to anyone you think may be interested in this type of service and I’d be happy to discuss some ideas with them! 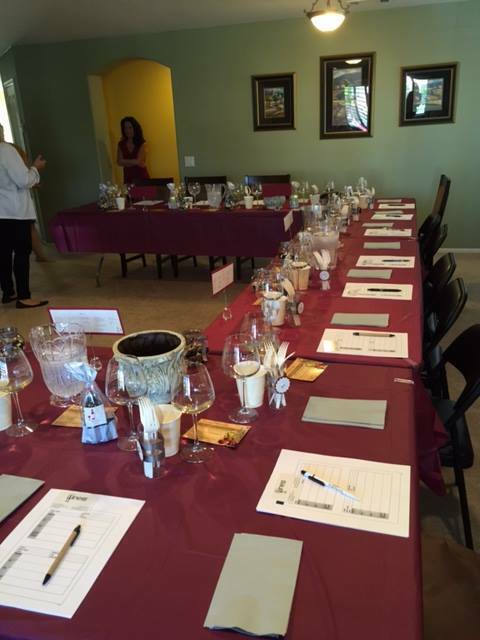 I am more than happy to discuss different types of tasting parties – there are so many! Once the type of party is selected, I can supply stemware for up to 24 guests, pour out buckets, decanters, an ice bucket, pens and worksheets. We had a fabulous time. I have received a few emails today from people saying what a good time they had. 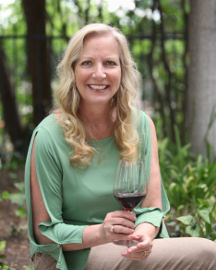 My husband and I are already talking about doing it again…You are not only knowledgeable in the world of wine but you have the personality to start and keep the event going! You are fantastic! All true. I felt like I was attending the party. Which is fabulous. Normally when you are hosting, you are running around doing everything and not enjoying it. You did it all so I could enjoy. I can not say enough on how great you are. About Eve Bushman: I’ve been writing for over 18 years. About 7 years ago I chose to write exclusively on wine education for beginners. I received my Level 2 Intermediate Certification from Wine & Spirits Education Trust (WSET) in 2010. In November 2011 I was interviewed for The Wine Down Internet show, on the subject of “Wine Immersion” by Casa Dumetz winemaker Sonja Magdevski (Emilio Estevez’s fiancé) and her co-host Brandon Bartlett. You can view it via this link: http://www.youtube.com/watch?v=deg0V7gyRcg&list=PLC0CC3F426BBF8150&index=5&feature=plpp_video and the show currently has had over 8,600 views. 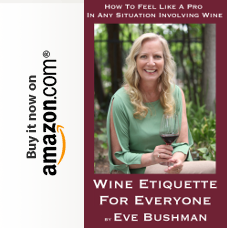 In 2014 I was the guest judge for the LA International Wine Competition and later penned “Wine Etiquette for Everyone” ($0.99 download http://goo.gl/MM9Lux), a less than 20 page e-book that had over 1,500 downloads within the first five days of release. More: http://evebushmanconsulting.com and articles can be read http://evewine101.com, http://www.ScvEliteMagazine.com/ and http://westranchbeacon.com.